Duesenberg president Harold T. Ames knew that sales of the Model J could be improved if the firm offered a series of catalog customs, however he realized that the firm’s clients wouldn’t bite unless a well-known coachbuilder was involved. Hence the mid-1930 emergence of LaGrande, Duesenberg’s exclusive in-house coachbuilder. 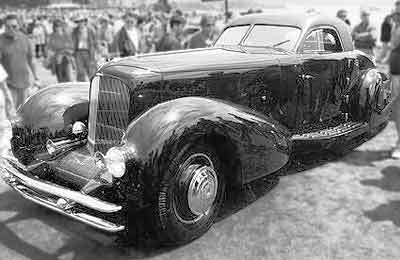 In reality, LaGrande was a fictitious builder, formed to help sell the designs of Duesenberg’s body designer Gordon Buehrig. An in-house coachbuilder enabled Duesenberg to keep close tabs on quality and give them a tidy profit as all LaGrande bodies were built by production body builders who could deliver a custom-appearing body for less than half the price of a true custom-built coach. At the time, Le Baron was the nation’s most prestigious builder, so it came as no surprise that Ames came up with a similar sounding name, LaGrande. He banked on the fact that many of their customers wouldn’t know the difference, and he was right as an estimated 29 LaGrande bodies were sold between 1931 and 1936. The LaGrande Sweep-Panel Phaeton made its debut at the 1931 New York Auto Salon, and was clearly based on earlier Swept-Panel designs created by Le Baron. Le Baron delineator Hugo Pfau recalled “We were unhappy to have not only our designs pirated, but even our name adapted with only a minor change and not a word of thanks or apology.” From that point on, Le Baron refused to build on the Indianapolis automaker’s chassis. Most of the bodies for the LeGrande program were supplied to Duesenberg in-the-white by the Union City Body Co. of Union City, Indiana. In-the-white refers to bodies delivered to a chassis manufacturer minus trim, paint, varnish and hardware. Union City was a major supplier to Auburn and the bodies for the legendary Auburn Speedsters were built there. Union City also built 8 LaGrande bodies for the Cord L-29's custom body program, 2 Town Cars, 2 Victorias, 1 Coupe, 1 Salon Sedan, 1 Boattail Speedster and 1 Sedan. A pair of SWB roadster bodies and 2 unsold Cord L-29 bodies (one a sedan, the other unknown) were supplied to Duesenberg's LaGrande program by the Central Manufacturing Co. of Connersville, Indiana. The LaGrande Roadster coachwork was used on the much publicized 1935 SSJ roadsters while the leftover L-29 sedan body was mounted on a used Duesenberg chassis (J-189) in 1933. The other L-29 body, type unknown, was mounted on a new Duesenberg chassis (J-472) in 1933. Central Manufacturing was a subsidiary of Errett Loban Cord’s business empire, which also included Duesenberg. The third LaGrande builder, A.H Walker Company, of Indianapolis supplied Duesenberg with bodies trimmed and painted. A.H. Walker was totally unrelated to the Walker Body Co. of Amesbury, Massachusetts which went out of business in 1931. Harold T. Ames, Duesenberg’s president, wanted the firm’s coachwork to have a distinctive, yet congruous appearance. He greatly admired the work of Stutz’s in-house designer, Gordon Buehrig, and hired him as Duesenberg’s chief body designer a few days after the 1929 Indianapolis 500. Most early Duesenberg bodies were designed by Buehrig and built by outside coachbuilders such as Brunn, Derham, Holbrook, Judkins, Le Baron, Murphy, Rollston and Willoughby. Buehrig’s most popular design was the Beverly Sedan, built by both Murphy and Rollston. His personal favorites were the Derham Tourster and the Brunn Torpedo Phaeton (actually a convertible sedan). Philip Derham was Duesenberg’s official coachbuilders’ representative and spent lots of time on the road visiting the automaker’s authorized coachbuilders ensuring that Buehrig’s designs were adhered to. When Buehrig resigned in 1932, the factory coachwork program was put on the back burner and J. Herbert Newport Jr. was promoted to chief designer. Newport had previously worked with Derham at the short-lived Floyd-Derham works and was hired by Duesenberg on his recommendation. Newport had previously worked for Studebaker, Dietrich and Brunn before joining Duesenberg in February of 1933. Alex Tremulis, another legendary designer, was hired by Ames in 1933 to assist Newport and eventually became Auburn’s chief stylist when Buehrig left to work for Budd in 1936. A few Duesenberg bodies were designed by a handful of other coachbuilders, although Duesenberg claimed that all of their designs had to be approved in advance. The non-official builders included Barker, Fleetwood, Floyd-Derham (completed by Wolfington), Franay, Hibbard & Darrin, Kellner and F.R. Wood & Son. When Buehrig left Duesenberg in 1932, J. Herbert Newport Jr. took over as the firm’s chief designer. Newport is credited with the design of the two short wheelbase Duesenberg SSJ roasters as well as the Lilly Coupe now owned by Jay Leno. Buehrig returned to the automaker late in 1933 to design the Baby Duesenberg, but spent most of his time working on new designers for Auburn. Walker’s highly skilled craftsmen and low-key operation were well suited to prototype development and it was in the Walker factory that the body for the prototype Cord 810 (Cord E-1) was built using an experimental chassis designed by August Duesenberg. The coachwork was designed by Gordon Buehrig, who had recently been re-hired by Harold Ames to help design a ‘baby Duesenberg’ using components sourced from the Auburn parts bin. The stunning 4-door sedan was completed in ten weeks during the spring of 1934, but was set aside for a number of months while Ames and Buehrig tended to more important matters such as face-lifting the 1935 Auburns. 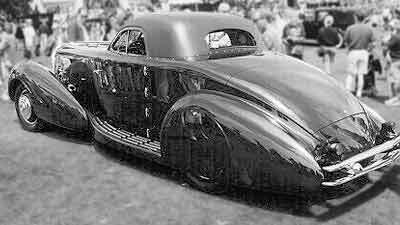 When Duesenberg wanted another pair of Brunn Torpedo Phaetons they contacted Bert Walker who was looking for work following the closure of Weymann-American. Weymann-American had built two “Brunn” Torpedo Phaetons for Duesenberg before they shut their doors, and Walker was the logical choice to supply additional examples. Walker took out a short-term lease on the Indianapolis Weymann plant in 1934 and hired a handful of former Weymann craftsmen and got to work. In addition to the 2 Torpedo Phaetons, Walker also built 3 Convertible Coupes, the famous J. Herbert Newport Jr.-designed Lilly Coupe (owned by Jay Leno) and a Convertible Sedan that was finished by Bohman & Schwartz after Walker closed shop in early 1935 and returned to his native England. The Depression had put a severe damper on Duesenberg sales and unsold chassis were piling up in Indiana. Things were just as bad at many of the firm’s authorized coach builders, Murphy closed down in 1932 and many of the others were close to bankruptcy. Designs and bodies in the white dating from the early thirties were mothballed until sales slowly began to pick up in 1934. A number of coach builders began to specialize in customizing existing Duesenberg bodies and re-bodying earlier Duesenberg chassis. The leader in the field was Bohman & Schwartz of Pasadena, California which was formed by Christian Bohman and Maurice Schwartz, two former Murphy employees. 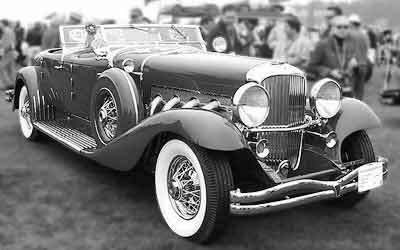 Duesenberg was no longer in any position to dictate how their chassis could be bodied and a number of unusual bodies were built by the Pasadena coachbuilder for their eccentric Hollywood clientele. The GAF Auto Museum in Longview Texas houses the original automotive drawings of J. Herbert Newport Jr. Many of Gordon Buehrig’s originals can be seen at the Auburn Cord Duesenberg Museum in Auburn, Indiana.